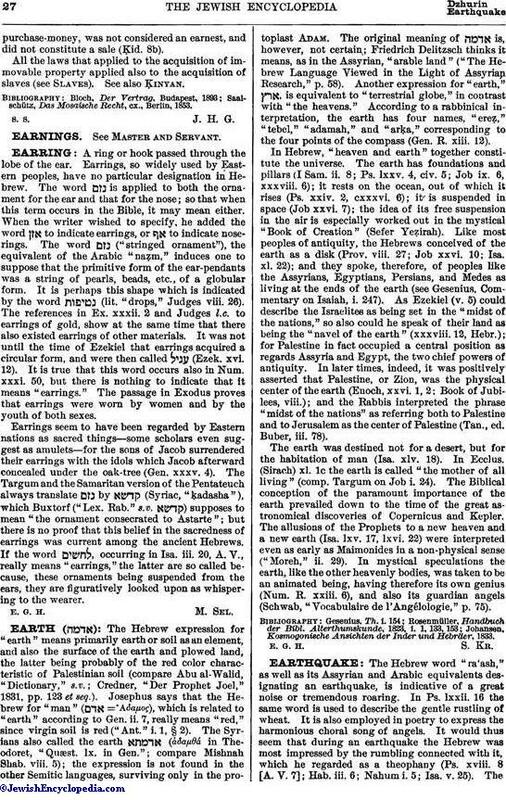 The Hebrew expression for "earth" means primarily earth or soil as an element, and also the surface of the earth and plowed land, the latter being probably of the red color characteristic of Palestinian soil (compare Abu al-Walid, "Dictionary," s.v. ; Credner, "Der Prophet Joel," 1831, pp. 123 et seq.). Josephus says that the Hebrew for "man" ( = Αδαμος), which is related to "earth" according to Gen. ii. 7, really means "red," since virgin soil is red ("Ant." i. 1, § 2). The Syrians also called the earth (ἀδαμδά in Theodoret, "Quæst. lx. in Gen."; compare Mishnah Shab. viii. 5); the expression is not found in the other Semitic languages, surviving only in the protoplast Adam. The original meaning of is, however, not certain; Friedrich Delitzsch thinks it means, as in the Assyrian, "arable land" ("The Hebrew Language Viewed in the Light of Assyrian Research," p. 58). Another expression for "earth," , is equivalent to "terrestrial globe," in contrast with "the heavens." According to a rabbinical interpretation, the earth has four names, "ereẒ," "tebel," "adamah," and "arḳa," corresponding to the four points of the compass (Gen. R. xiii. 12). In Hebrew, "heaven and earth" together constitute the universe. The earth has foundations and pillars (I Sam. ii. 8; Ps. lxxv. 4, civ. 5; Job ix. 6, xxxviii. 6); it rests on the ocean, out of which it rises (Ps. xxiv. 2, cxxxvi. 6); it is suspended in space (Job xxvi. 7); the idea of its free suspension in the air is especially worked out in the mystical "Book of Creation" (Sefer Yeẓirah). Like most peoples of antiquity, the Hebrews conceived of the earth as a disk (Prov. viii. 27; Job xxvi. 10; Isa. xl. 22); and they spoke, therefore, of peoples like the Assyrians, Egyptians, Persians, and Medes as living at the ends of the earth (see Gesenius, Commentary on Isaiah, i. 247). As Ezekiel (v. 5) could describe the Israelites as being set in the "midst of the nations," so also could he speak of their land as being the "navel of the earth" (xxxviii. 12, Hebr. ); for Palestine in fact occupied a central position as regards Assyria and Egypt, the two chief powers of antiquity. In later times, indeed, it was positively asserted that Palestine, or Zion, was the physical center of the earth (Enoch, xxvi. 1, 2; Book of Jubilees, viii. ); and the Rabbis interpreted the phrase "midst of the nations" as referring both to Palestine and to Jerusalem as the center of Palestine (Tan., ed. Buber, iii. 78). The earth was destined not for a desert, but for the habitation of man (Isa. xlv. 18). In Ecclus. (Sirach) xl. 1c the earth is called "the mother of all living" (comp. Targum on Job i. 24). The Biblical conception of the paramount importance of the earth prevailed down to the time of the great astronomical discoveries of Copernicus and Kepler. The allusions of the Prophets to a new heaven and a new earth (Isa. lxv. 17, lxvi. 22) were interpreted even as early as Maimonides in a non-physical sense ("Moreh," ii. 29). In mystical speculations the earth, like the other heavenly bodies, was taken to be an animated being, having therefore its own genius (Num. R. xxiii. 6), and also its guardian angels (Schwab, "Vocabulaire de l'Angálologie," p. 75). Johansen, Kosmogonische Ansichten der Inder und Hebräer, 1833.